New way to monetizing your site’s content with Google Consumer Survey. 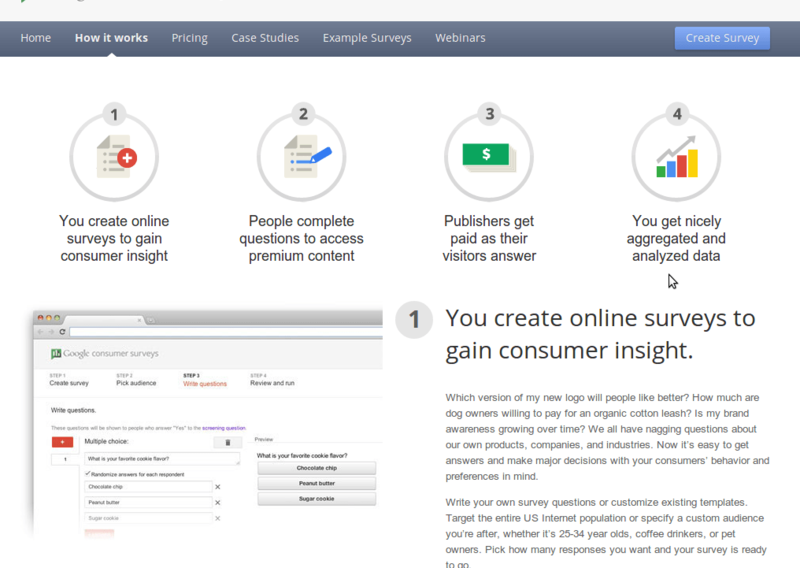 You are here: Home / news / New way to monetizing your site’s content with Google Consumer Survey. With the new launching of Google consumer survey, webmasters can now shows “One survey at a time” and get paid for web visitors answer to a survey. Price from 0.10 per survey. People browsing the web come across your questions when they try to access premium content like news articles or videos. Opinions are valuable, so answering the question gives them near instant access to the page they want for free. They don’t have to pull out a wallet or sign in and you gain insight into what people think. Why one question at a time? Many researchers are used to doing multi-question surveys in which the same respondent is asked to fill out a 10+ minute questionnaire. With Google Consumer Surveys, you can run multi-question surveys by asking people one question at a time. This results in higher response rates (15-20% compared with an industry standard of 0.1 – 2%) and more accurate answers. Questions run across sites in our diverse publisher network in order to get the necessary respondents. Publishers—online news sites, video creators, and app developers—make money as site visitors provide answers. Everyone wins. Learn how to earn money hosting surveys.